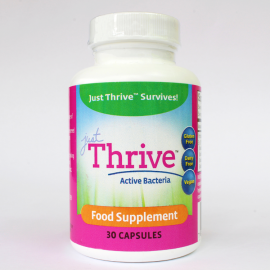 hrive is a new, high potency probiotic supplement designed to boost health, vitality and immunity. Each of these 4 strains have been verified and tested for safety and efficacy. In fact, Bacillus Subtilis and Bacillus Clausii have been used as a prescription probiotic in Europe and in Asia for over 60 years. All of these strains are a specialized class of probiotics called biphasic sporulating species. They have the ability to form a thick, protective, armor-like shell around themselves once they leave the body to make them extra stable in the environment. This also allows them to easily survive the harsh gastric system so they get to the intestines alive and completely viable. These bacillus species are a natural part of the human environment and for thousands of years humans have consumed these species as part of the diet.